This is part of the second campaign they have prepared in trying to convince Nintendo to bring over Xenoblade, The Last Story, and Pandora’s Tower. 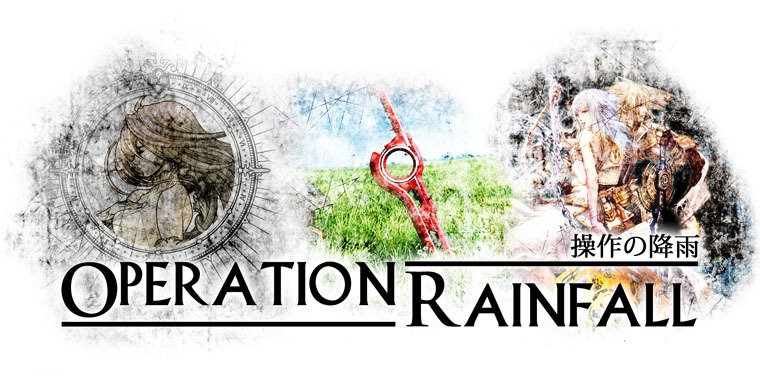 As mentioned almost two weeks ago, Operation Rainfall was going to ready another mailing campaign in which they’ll send letters to Nintendo again the day Xenoblade is released in Europe. Since then, Nintendo of America President Reggie Fils-Aime said that they’ll “be watching very closely what happens in Europe… Certainly if there are business opportunities and positive consumer uptake from some of those titles, that will be great data for us to consider as we look at what to do with these titles.” It somewhat falls in line with what Operation Rainfall wanted to do in their second phase in regards to increasing awareness of Xenoblade in Europe to make it a success. So what of Final Fantasy? Well, Operation Rainfall is telling its supporters to go and buy the original Final Fantasy on the Wii Virtual Console, which costs 500 Wii Points. This is to show Nintendo that there is still a market for JRPGs. I can see their logic in telling its supporters to buy Final Fantasy as it’s one of the most well known J-RPGs out there. However, the one main flaw I see in that is that Final Fantasy, as a franchise, is pretty popular based on brand recognition alone and is not very niche like the Rainfall titles. Plus, the first Final Fantasy has been on so many platforms already, people are bound to already have it on one of them (I have it on PS1). In a sense, Final Fantasy has that somewhat Mario-like transcendence of genre to the point that those who don’t normally play JRPGs still play Final Fantasy (either that or they have no idea that Final Fantasy is a JRPG). A better idea would’ve been to tell supporters to buy a JRPG from the Virtual console rather than a specific one. Maybe compile a list of what is considered a JRPG, like Breath of Fire II or Ys Book 1 & 2 for example, and let supporters choose. Now it may be problematic as numbers would be sporadic amongst many titles rather than it being condensed into one title, thus having those sales be attributed to regular run-of-the-mill sales. If they really needed to choose one title, Final Fantasy wasn’t the answer. This entry was posted in Gaming News and tagged c'mon son! er I mean reggie, final fantasy, nintendo, operation rainfall, pandora's tower, the last story, wii, xenoblade on August 14, 2011 by Steven T..